The Connemara International Marathon brings thousands of runners and spectators to this beautiful part of Ireland and for their safety there will be strict traffic restrictions throughout the course which may affect local residents. 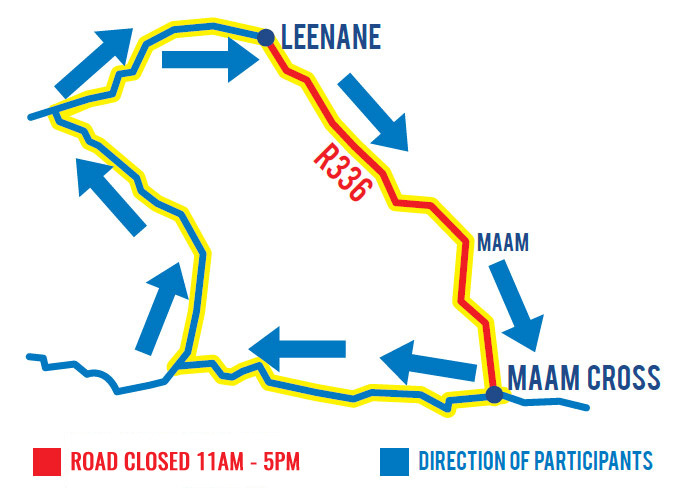 While we are planning for the event to cause minimal disturbance, the road between Leenane and Maam Cross (the R336) will be closed from 11.00am until 5.00pm (at the latest) on Sunday 14th April 2019. The roads will reopen after all participants have passed. As per the application to Galway CoCo emergency access and egress is maintained at all times. In the case of an emergency please follow standard emergency procedures. Emergency vehicles will have access at all times. If a resident needs access or egress in an emergency situation please contact the liaison officer Eoin Ryan on 087 9758056 or alternatively Andrew Deakin on 087 6667015. If you have a concern that you wish to express, please forward this in writing accompanied by a return address and contact phone number to Dolmen Sports, Moy Road, Kinvara, Co. Galway and it shall be responded to within 10 working days.